Fire Scene Investigation - Fire Scenes can be attended principally to establish where, how and when the fire started. Gas/Vapour Explosions - The investigating of deflagrations such as mains gas and flammable liquid vapour explosions, including those incidents associated with LPG cylinders. Endangerment to Life Assessments - An opinion can be given on whether or not a fire posed a risk to the lives of the occupants of a premises. Additionally if a fire was discovered and extinguished early in its development, an opinion can be given on the potential spread of a fire following an incident and whether or not that spread could have endangered any occupants or persons in neighbouring properties. Examination and classification of petrol bombs and incendiary devices. Heat damage to clothing and footwear or “flashburning” – Garments and footwear can be examined visually and microscopically for the presence of heat damage caused by exposure to heat or flame. This is particularly useful if it is alleged that the wearer of the clothing was present at the ignition of a volatile flammable liquid. Appliances – Gas, electric and liquid fuel appliances are a potential cause of a fire and sometimes need to be examined for evidence of faults or misuse. 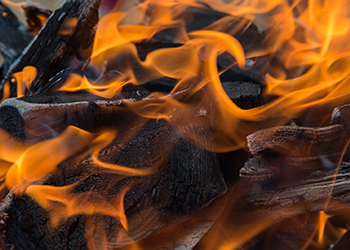 Burning tests can be undertaken to determine whether or not certain materials are capable of being ignited, under what conditions they will burn, how they behave whilst burning and the post fire effects on the item. Child Protection Cases – In some cases children present with burns and the alleged cause of the injury is given as an electrical or gas appliance, hot water or central heating system. Either at the scene or in the laboratory the conditions can be recreated, temperature measurements carried out and the hypothesis tested. The these tests can be used by an appropriately qualified paediatric burns specialist to determine if the temperature produced could be sufficient to cause the injuries. Case Review – A full review of all of the paperwork in a fire case can be reviewed with the intention of finding alternative hypotheses, assuring the quality of the evidence in the case or to enhance the case prior to court. Training – Fire Awareness, an Introduction to Fire Investigation through to a full week course involving practical room burns and excavations.